I’ve written about this one before, so please excuse me for returning to a favourite. Once again, we must confront the Dark Lord of Skronk. Dare ye look upon his face a second time? Oh yeah, Robert Fripp: the gentlemanly looking guitar torturer behind some of the finest uses and abuses of the instrument in rock music. Every solo I’ve looked at over the years has had an emotional point. I’ve never been a fan of shows of virtuosity for their own sake. Robert Fripp’s playing on Starless radiates emotion, though the feelings being communicated are, to say the least, ambiguous. The song begins in a minor key, with held Mellotron chords. Fripp plays a haunting melody over these chords, demonstrating his total control over tone and articulation. Every note has the right amount of sustain and vibrato. His choice of which string and fret to play the notes is equally precise and assured. After three verses sung by Wetton (the main writer of this section of the song), the band drop out and Wetton plays a threatening-sounding 13/8 bass riff in C minor while Fripp plays a G note across two strings (he’s fretting the G string at the 12th fret and the B at the 8th, producing two Gs with slightly different tones and picking them alternately). Then as the riff switches to F, Fripp plays a discordant Gb, then back to G when the riff returns to C. This sequence repeats, and the tension starts to build via a long held G (major or minor? Neither Wetton nor Fripp is spelling that out yet). How long can anyone play just two notes? If you’re Robert Fripp, quite a long time, long past the point where it begins to make the listener uncomfortable. Wetton and drummer Bill Bruford go through the sequence a second time, and it’s only towards the end of this repeat that Fripp starts climbing, semitone by agonising semitone, upwards in pitch. As he and Wetton begin to play with more volume and distortion, Bruford (the author of that bass riff) joins in. After another repeat of the full sequence, during which Bruford has kept things moderately quiet, playing games with backbeat placement and generally adding to the rising tension, the band finally abandon restraint and go at it hard. Fripp plays oblique bends with a thicker, more distorted tone, Wetton’s bass is, likewise, now truly distorted, and Bruford switches to the ride, playing less abstractly and more like a conventional rock drummer (albeit one who can count odd-numbered beats in the bar), hitting hard and keeping things straighter. As Fripp goes higher and higher, the cumulative effect goes a long way beyond tense into hysterical, with Fripp’s guitar positively shrieking. Finally the tension breaks, and the band goes into a double-time section, with saxophonists Mel Collins and Ian MacDonald playing dueling solos. I’d pretty much still go along with that. This music has an evocative power I’ve not heard anywhere else. I’m not sure whether any of what Fripp and co did here was improvised or whether it was all through-composed. I suspect the latter, but either way, it’s guitar playing of the highest order, so far ahead of what the band’s contemporaries were doing in 1974, it’s untrue. It seems scarcely believable that the day Starless was released, the number-single in the UK was Annie’s Song by John Denver, having taken over the day before from Carl Douglas’s Kung Fu Fighting. This entry was posted in Music and tagged guitar, guitar solos, King Crimson, mellotron, oblique bends, progressive rock, Red, Robert Fripp, Starless on March 16, 2019 by rossjpalmer. It’s not a controversial opinion to suggest that the greatest betrayal of artistic first principles in the popular music canon is that of Jefferson Airplane/Starship in its 20-year journey from White Rabbit to Nothing’s Gonna Stop Us Now. 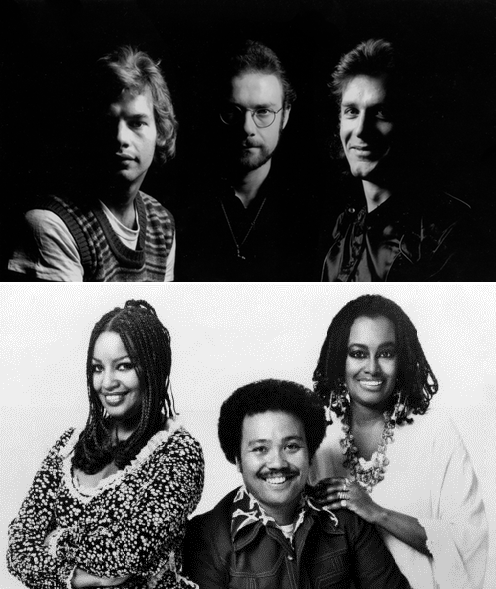 But when considering the risk to musical credibility of chasing a fast buck, there seems to me to be an even more salutary tale: the fact that John Wetton, who co-wrote and sang Asia’s Heat of the Moment, earlier in his career also co-wrote and sang Starless, the final track on King Crimson’s 1974 album Red. Red was the last album that King Crimson made during its first run (band leader Robert Fripp would call time on the group just before the record came out; he’d spend the next few years as a guitarist and producer for hire, doing fascinating things with David Bowie, Blondie, Peter Gabriel, Talking Heads and Daryl Hall). 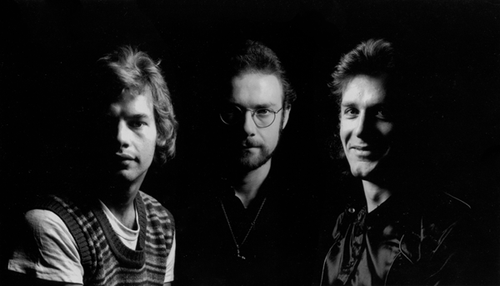 Red was made by a core 3-piece of Fripp, Wetton (bass and vocals) and Bill Bruford (drums). The record’s instrumental palette is widened in places by Ian McDonald’s alto and Mel Collins’s soprano saxophones on Starless, and by cello, violin and oboe elsewhere, but primarily Red is a guitar album. And if you’re a fan of Robert Fripp’s playing, that’s a very good thing indeed. The album’s twin pillars are its first and last tracks: the title track and the aforementioned Starless. Red (the song, not the album) I won’t dwell on long except to recommend it thoroughly. Built on an angular, grinding guitar riff of Fripp’s, it’s the sound of a band transforming itself into some kind of infernal tank, heavy enough to roll over any obstruction, each semitonal shift like the changing of gears of a monstrous war machine. Starless is a formally more complex piece, in three sections. The first is essentially a ballad, written and sung by Wetton. It’s carried by Fripp’s meditative minor-key Mellotron chords and lyrical guitar melody, originally played by violinist David Cross. After Cross left the group at the beginning of the sessions, Fripp inherited and adapted it. The song had been tried out for the previous year’s album (eventually called Starless and Bible Black, despite the absence of the song that had inspired the title), but hadn’t really caught on with Fripp and Bruford at first. The revived Wetton composition was paired with an evil-sounding bass riff by Bruford in – what else? – 13/8 time. Never let a prog drummer write your tunes unless you enjoy counting. This riff underpins a long improv section that forms the second third of the song, with the last section comprising a double-time freakout for soprano sax and guitar, which finally resolves into a reprise of Fripp’s opening theme (also now in double time). But to describe it in terms of its structure doesn’t really get at what makes Starless so affecting. Let’s come at it another way and discuss it in terms of mood, emotion, text and subtext. How else to interpret that long middle section? It begins with Wetton’s bass and Fripp’s guitar, while Bruford plays assorted percussion. Wetton plays that threatening-sounding 13/8 bass riff in C minor while Fripp plays a G note across two strings (he’s fretting the G string at the 12th fret and the B at the 8th, producing two Gs with slightly different tones and picking them alternately). Then as the riff switches to F, Fripp plays a discordant Gb, then back to G when the riff returns to C. This sequence repeats, and the tension starts to build via a long held G (major or minor? Neither Wetton nor Fripp is spelling that out yet). How long can anyone play just two notes? If you’re Robert Fripp, quite a long time. Eventually he begins to climb upwards in pitch and intensity, and soon Fripp is playing oblique bends with a thicker, more distorted tone. Wetton’s bass is, likewise, now truly distorted. Once Bruford joins in on full kit, and particularly once he switches to the ride at about 8.30 and begins playing less abstractly, the cumulative effect goes a long way beyond tense into hysterical, with Fripp’s guitar positively shrieking. It’s impossible to overstate the evocative power of this 5-minute middle section. It sounds like the war machine evoked in the album’s opening track has returned with evil in its heart. The final freakout is, if one wants to follow this interpretation through, the apocalypse itself, and while any musical evocation of the eschaton is bound to come up short, Starless (even in its title) gets closer than just about anything else. Few rock bands were going to places like this in 1974, certainly not King Crimson’s English progressive contemporaries. Red, and Starless in particular, is timeless. It still sounds like tomorrow. The tomorrow after which there will be no tomorrow. This entry was posted in Music and tagged 13/8 time, 1970s, alternative rock, Asia, Bill Bruford, Blondie, Daryl Hall, David Bowie, David Cross, distorted bass, double bass, drummers, Drums, Fred Neil, guitars, Heat of the Moment, Ian McDonald, Jefferson Airplane, John Wetton, King Crimson, lead guitar, Mel Collins, mellotron, nick drake, Nothing's Gonna Stop Us Now, odd metres, Paint it Black, Peter Gabriel, Prog, progressive rock, Red, Robert Fripp, Rolling Stones, saxophone, squonk, Starless, Starless and Bible Black, Starship, Talking Heads, violin, White Rabbit on May 1, 2015 by rossjpalmer. I was going to write a piece today prompted by Sophie Heawood’s article in the Guardian this morning (‘Music has died now I’ve thrown away my CDs and only listen on my laptop’) so here it is. But only kind of. Unfortunate though it is to admit, contemporary pop music has left me pretty cold for around a decade now, but for me my playback equipment is a long way down the list of things that are wrong. Like Heawood, I have also disposed of my old separates system, but I still listen to music on the best speakers I can afford in the best quality files I can get hold of. And I have, at least for now, kept all my CDs and records in case I one day have the space again to house a proper hi-fi set-up. But as hard-drive space gets cheaper every year, there’s no reason to suppose that lossless files won’t be the invariable norm in a few years and the old MPEG-1 Layer 3 consigned to history’s dustbin. What’s sad to me, contemplating contemporary pop and rock music, is that when I do hear something I like, I tend to tire of it quite quickly – the trends towards total rhythmic quantisation, the tuning of every vocal part without listening to it first to hear whether it actually sounds in tune or not, and the brutal and unmusical over-compression of every element within the mix, and of the stereo mix at mastering, have led to the creation of an art form that does little for me, whose pleasures are exhausted quickly. I tend not to be able to live inside these songs. I love being able to live inside a song. And thankfully it still happens pretty regularly that I find something that takes me somewhere entirely new. Recently I have been spending a lot of time wandering around the apocalyptic blasted-heath landscapes of King Crimson’s Red, the album’s final track, Starless, in particular. It’s an incredibly sad song, it sounds like the world ending. Strangely, though, I find a lot of comfort from this exhilarating, harsh piece of music. While I freely admit a bias towards early-nineties alt. rock and seventies singer-songwriters, relatively few of my absolute favourite songs are by my favourite artists (a list which is heavy on those seventies singer-songwriters and nineties rock bands). Instead, there would be a lot of one-off disco, country, hip-hop, soul records by artists whose work I am less familiar (who are in some cases only useful to me for one song). Let me tell you about one of these records, the track that, if forced to, I’d nominate for the title of best record ever made. A few years ago, on a freezing January Sunday, I first heard Odyssey’s Native New Yorker. I remember a lot about that day: meeting my then girlfriend in town for lunch, going for coffee afterwards, then cycling home in the cold. There was nothing exceptional in these activities; I remember them only because of what happened next. When I got home, I sat down at my computer and caught up with some websites I visit regularly. Some folks had been discussing Use It Up and Wear It Out on Freaky Trigger (where Tom Ewing reviews every UK number-one single as part of a feature called Popular. Years after starting, he’s in the mid-nineties now). I’d heard that song without taking much notice of it, but the big claims made on behalf of Native New Yorker by a couple of the regular commentors prompted me to have a listen to it on YouTube. I then downloaded the LP mix and listened to it 11 more times. In a row. One after the other, for over an hour, drinking it all in, the best (my apologies to Nile Rogers and the Bee Gees) disco record ever made. A great song (by Sandy Linzer and Denny Randall), brilliantly played, sung, arranged, recorded and mixed. A song I could live inside of for ever. A warm-hearted, urbane, bittersweet evocation of a place, a tribute so wonderful it actually makes me somewhat disinclined to ever visit it, in case the real thing was a let-down after years of living in Odyssey’s version of New York City. The goal of any music fan must surely to be to find the songs that make you feel this way. I’m not suggesting that Sophie Heawood’s disenchantment with music would be magically fixed if she adopted a steady diet of New York disco and English prog. What works for me won’t necessarily work for anyone else, and there’s no reason why it should. But despite the predictable cynicism and jeering of the comments below the article (a good way to lose your faith in humanity is to read the comments of any newspaper article – the internet really does bring out the worst in people), I suspect Heawood’s realisation that the music she’s listening to every day is doing nothing for her is actually a commonplace one. Whether the article would have been better placed in the Culture section, or used as the basis of an informal podcast discussion, is perhaps a worthwhile discussion. But the article’s basic premise is her lived experience, and as such can’t be denied by any amount of snark from the 690 people who’ve commented thus far. If they’re happy with their everyday music-listening experience, that’s great. I am too. Good luck to Heawood in improving her own. This entry was posted in General, Music and tagged Awesome guitar players, Bill Bruford, Disco, drummers who can drum/singers who can sing, Guardian, John Wetton, King Crimson, Lillian Lopez, Louise Lopez, Native New Yorker, Odyssey, Prog, records that sound great!, Red, Robert Fripp, Sophie Heawood, sound recording, Sound recording and reproduction, Starless, that seventies sound, Tony Reynolds, UK number one single on June 5, 2013 by rossjpalmer.